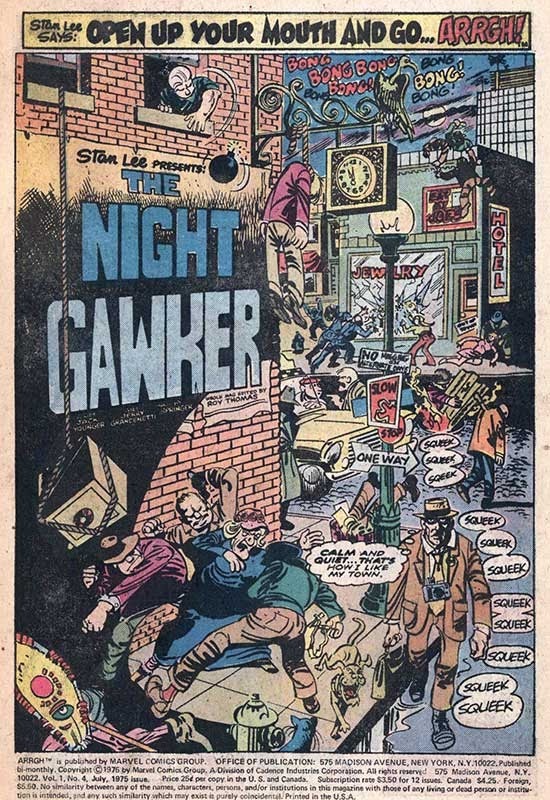 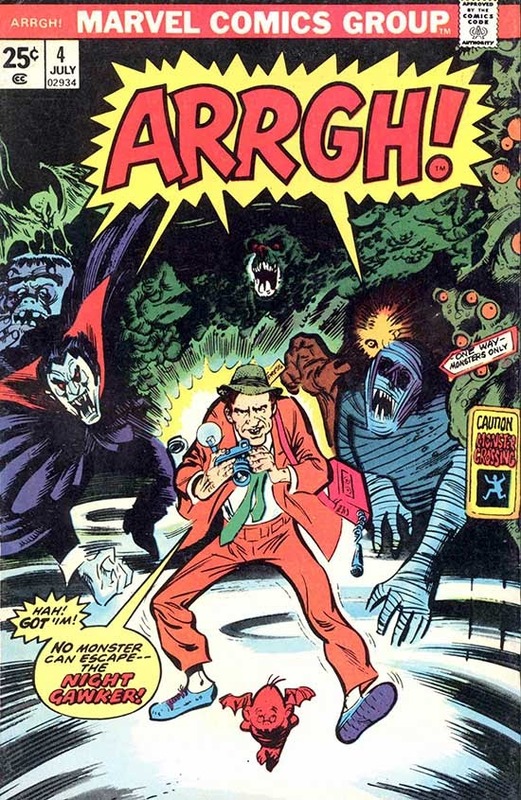 ...except for this never-reprinted parody in Marvel's ARRGH! 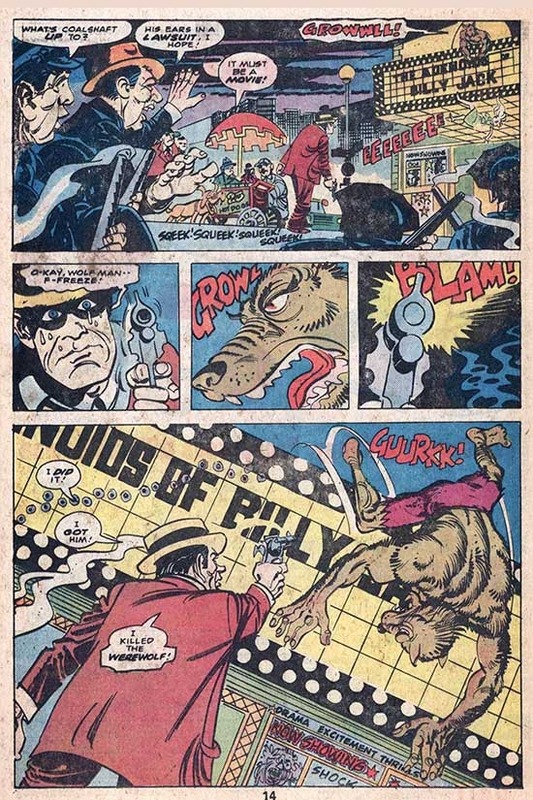 #4 (1975). 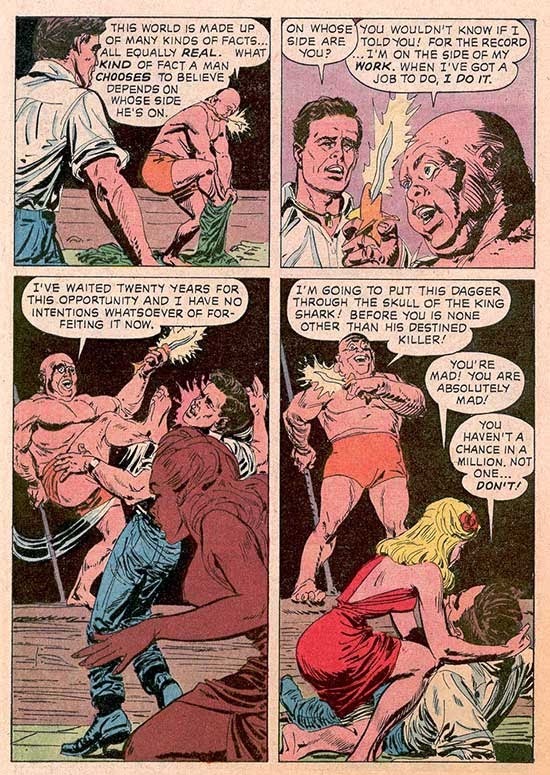 The art's much looser than the usual hyper-accurate caricatures we've come to expect from Marvel spoofs (like "Blechhula", as seen HERE! 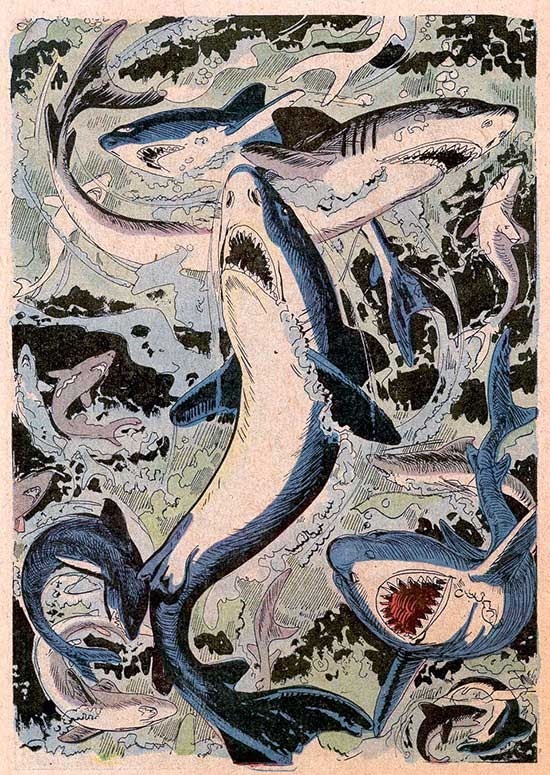 ), but the almost-abstract exaggeration works well telling the story! 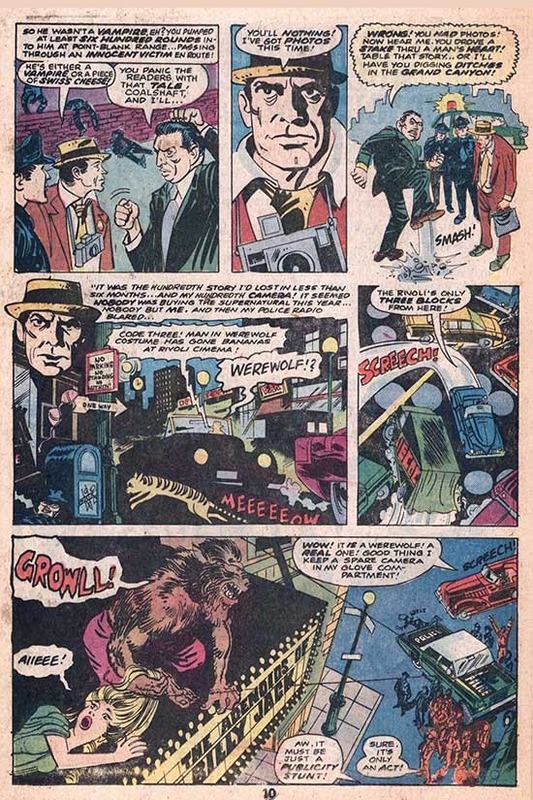 The strange thing is that this 10-pager reads pretty much like an episode of the show! 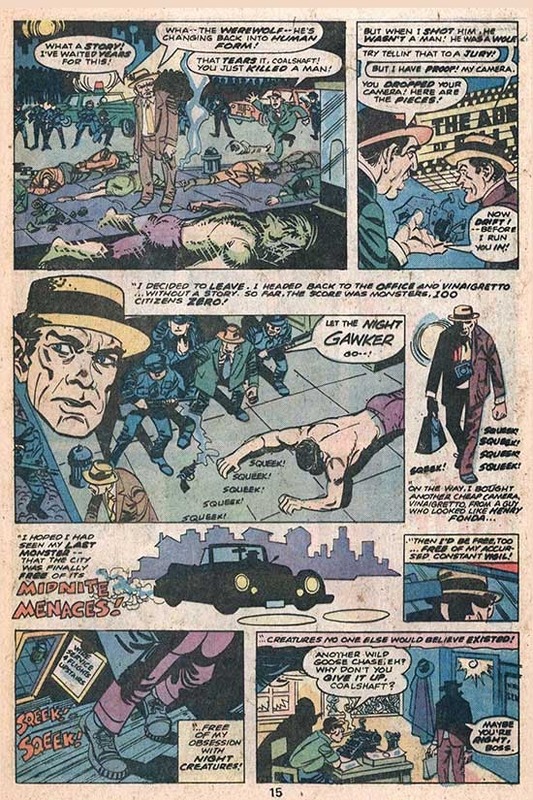 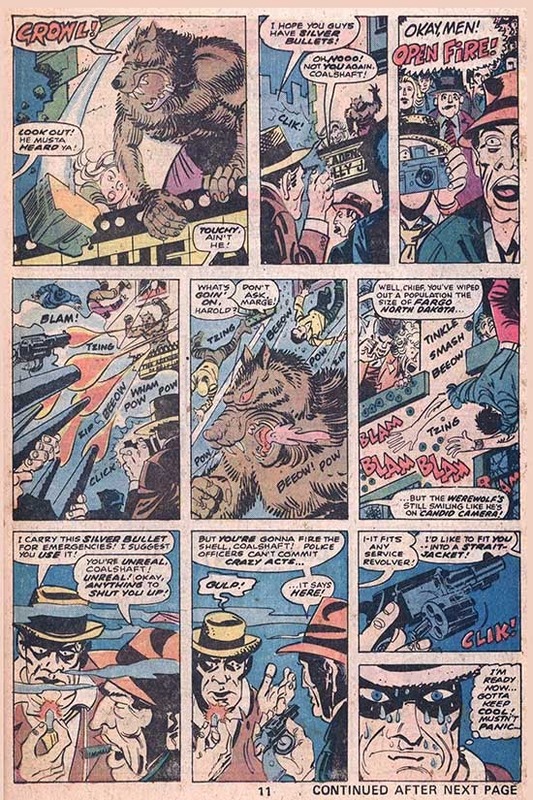 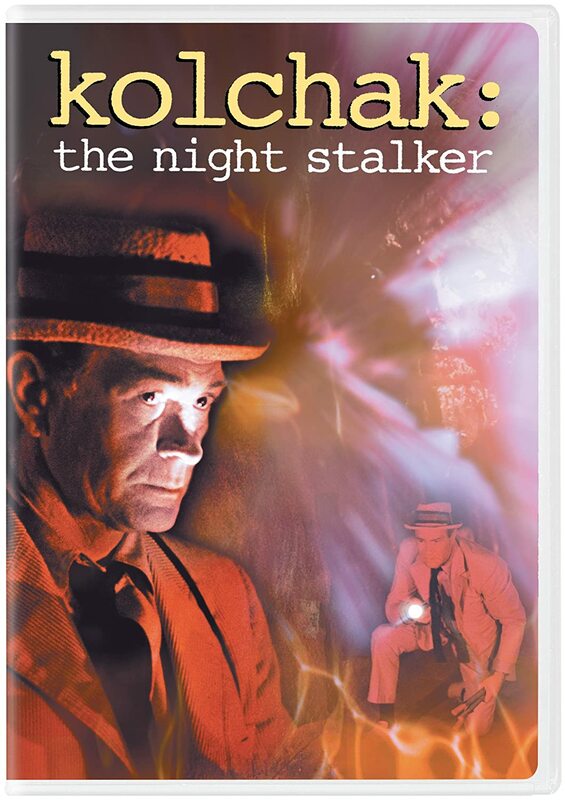 Kolchak investigates creatures that get the best of the Chicago Police, gets in trouble with both the cops and his boss, comes up with the solution to defeat/destroy the menace, yet the evidence of the creature's existence is inevitably destroyed (sometimes deliberately) and he has no story to publish! 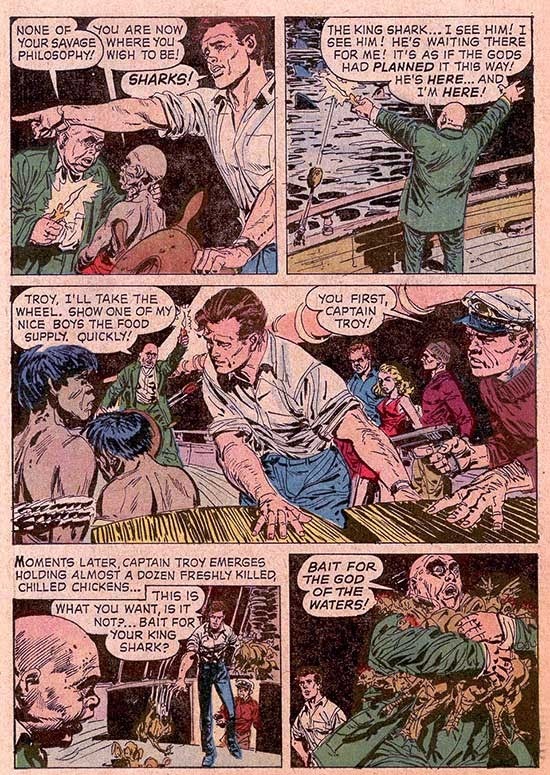 Interesting that neither writer Russ Jones (using "Jack Younger" as a pseudonym since he was also writing for Atlas/Seaboard Comics) and penciler Jerry Grandenetti were regular Marvel contributors! 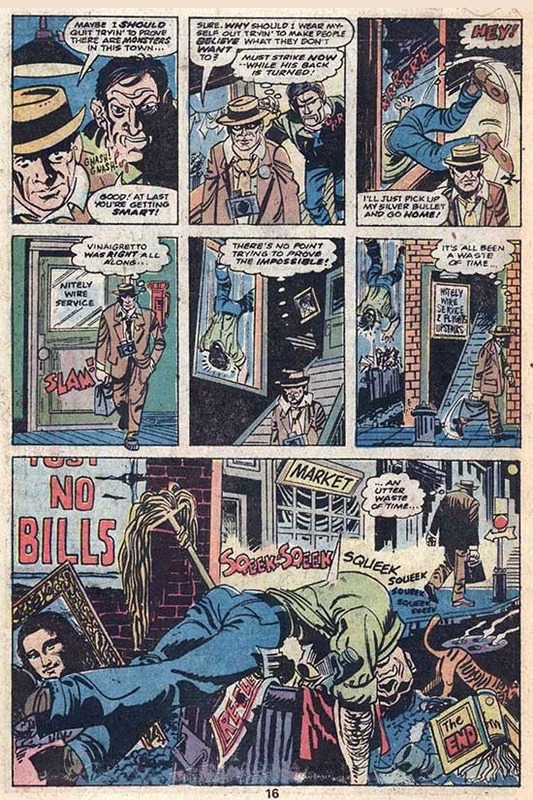 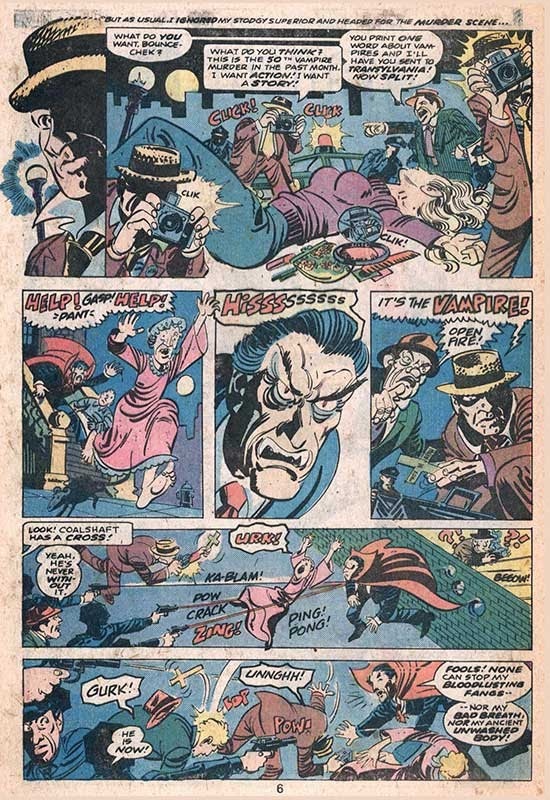 In fact, this was only Grandenetti's second art job ever for Marvel, after a war comic tale in the mid-1950s! 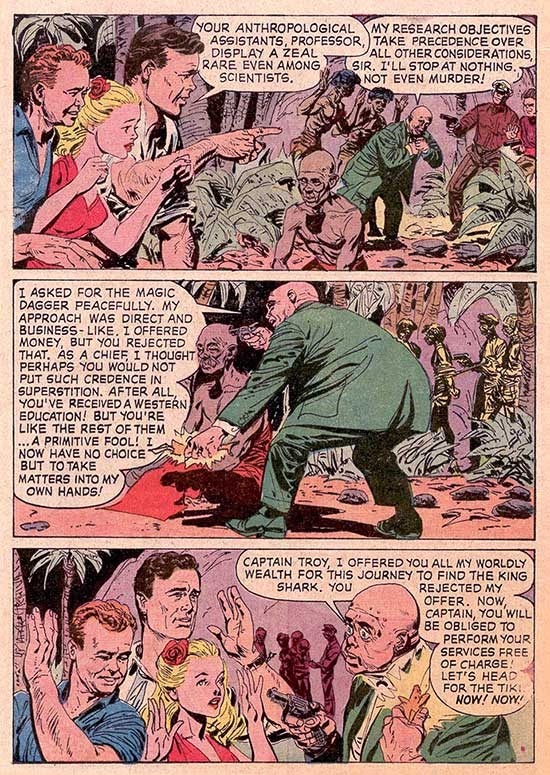 Please Support Secret Sanctum of Captain Video! 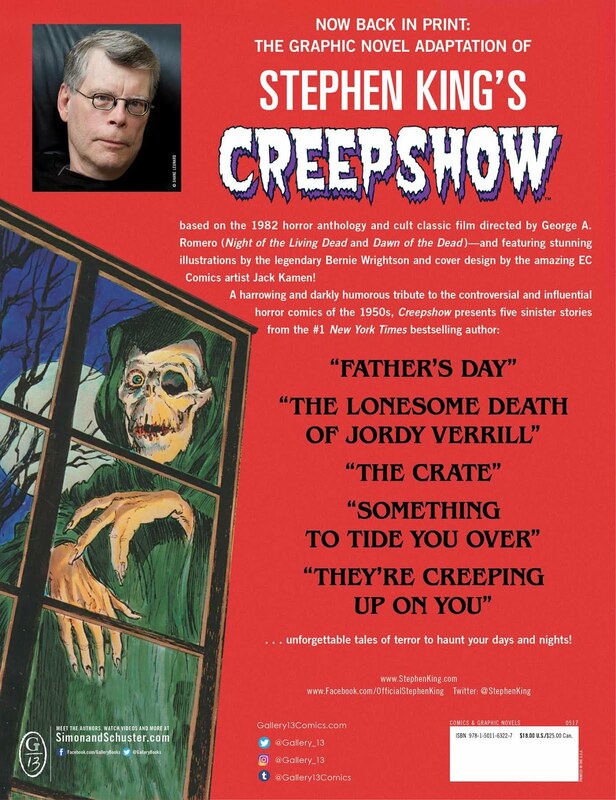 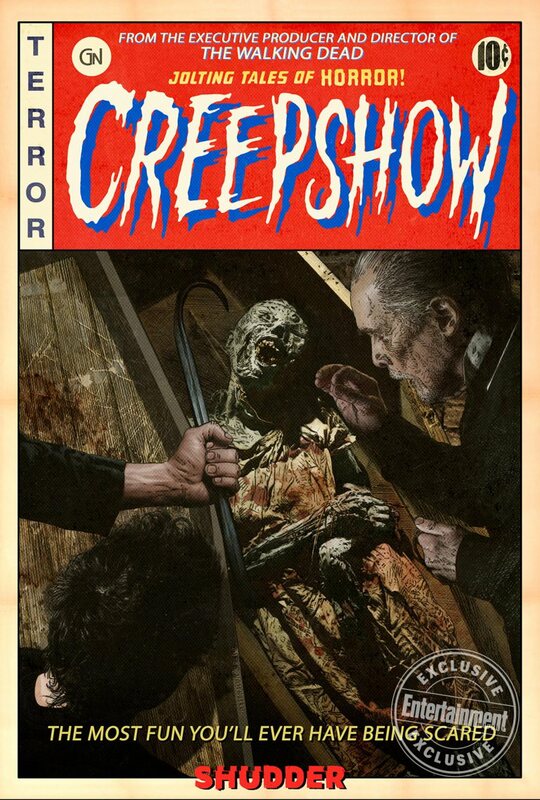 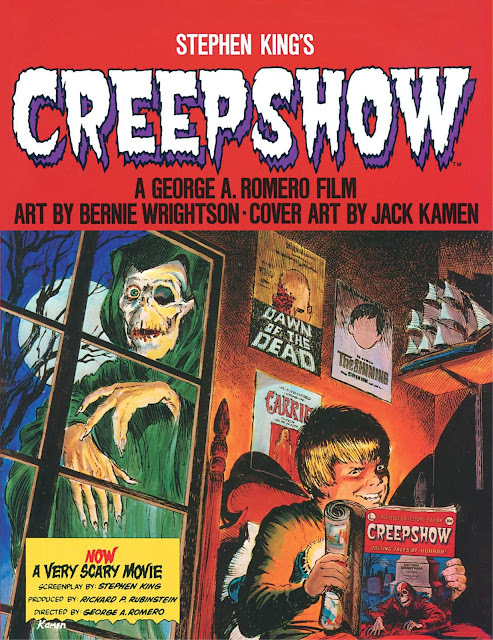 Based on the movie written by Stephen King, directed by George Romero, and inspired by EC Comics, the new series will be executive-produced, and occasionally directed by Greg (The Walking Dead) Nicotero who will also supervise the show’s creative elements. 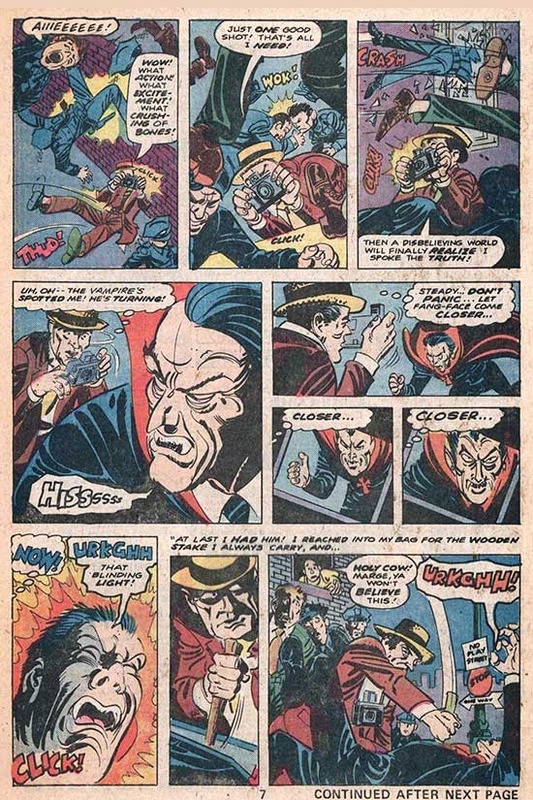 How close will they stay to the comic book-inspired "look" of the original movie? 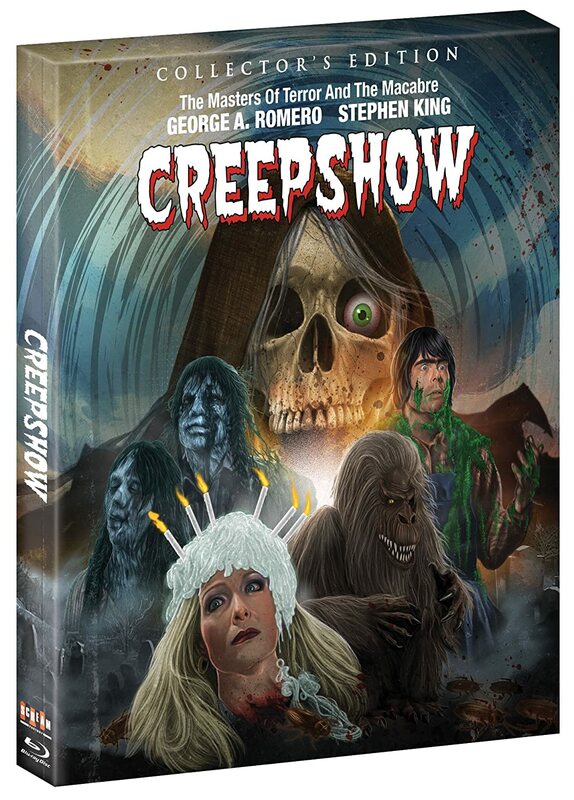 New Blu-Ray with AMAZING extras! 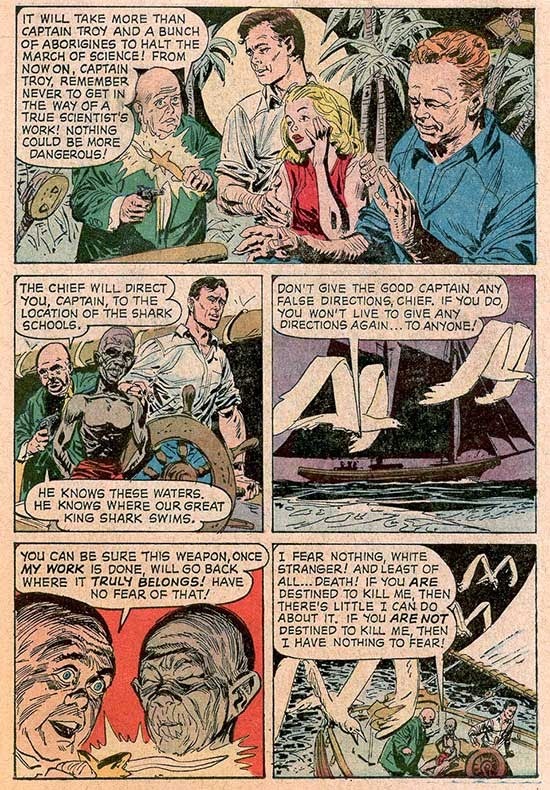 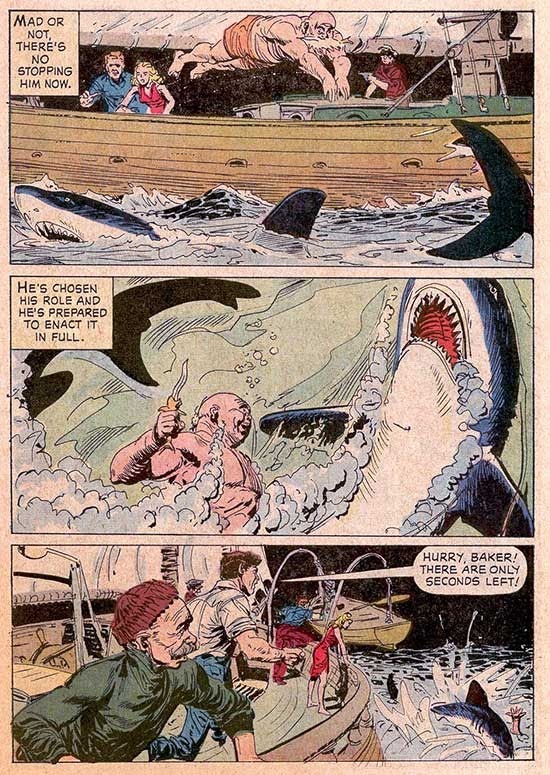 ...Professor Malvin, a scholar obsessed with South Seas legends of a "King Shark" hires Adam Troy and his schooner, Tiki to travel to the island where the legend originated. 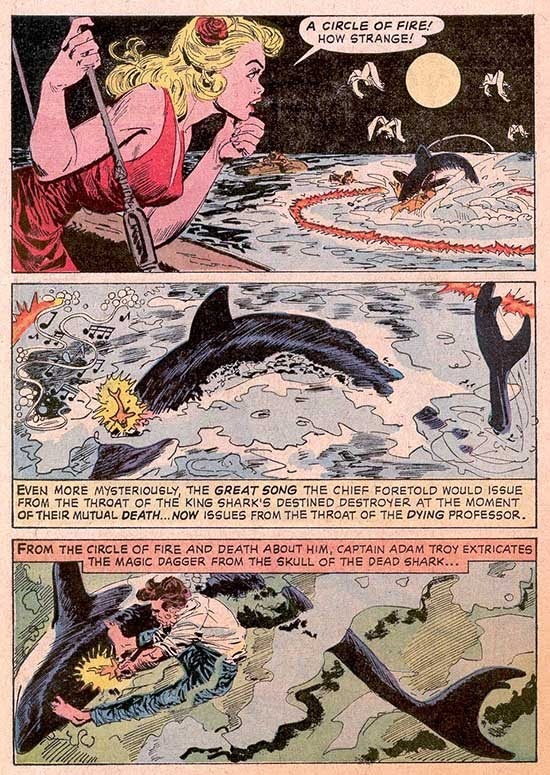 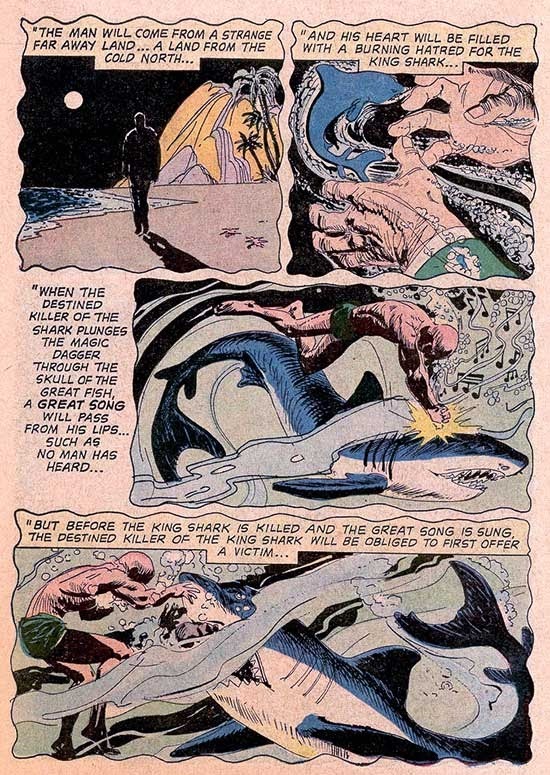 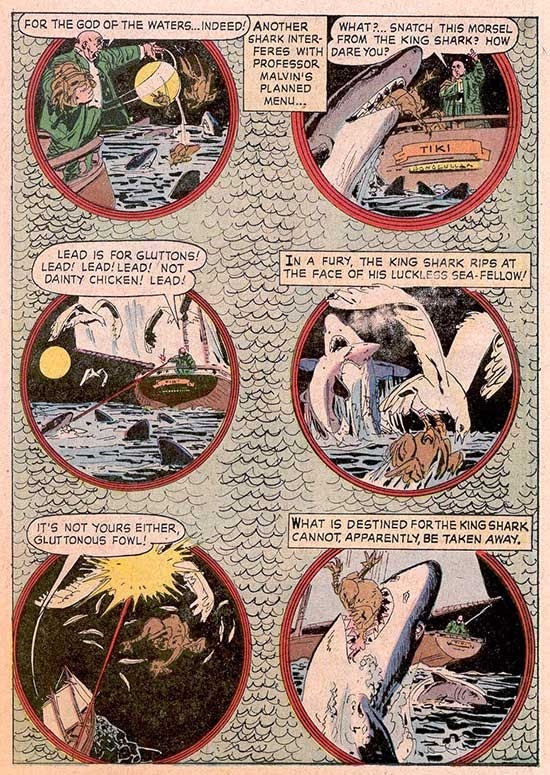 Arriving at the isle, the travelers meet the aged leader of the natives, who relates the tale and is then forced by Malvin to take them to the sharks' native waters, where freshly-killed poultry is used as bait to lure the "king shark" and his "court" to the Tiki! 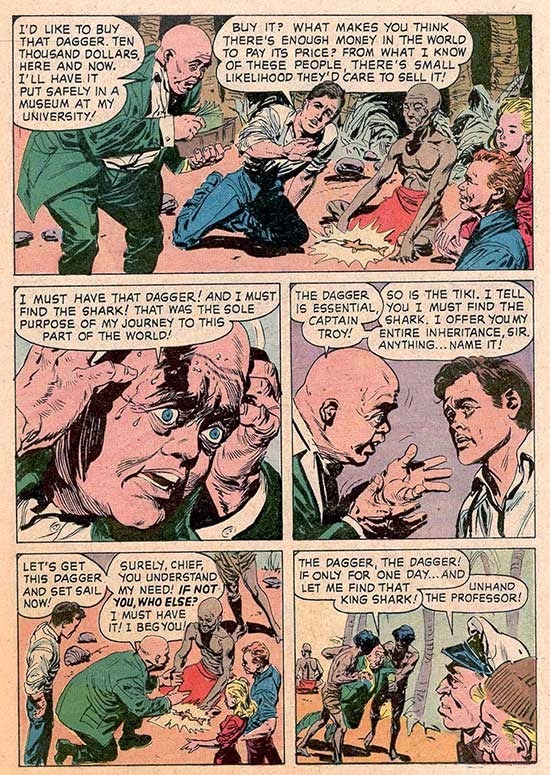 While prolific and versatile artist Jack Sparling rendered this never-reprinted tale from Dell's Four Color #1301 (1962), the author is, sadly, unknown! 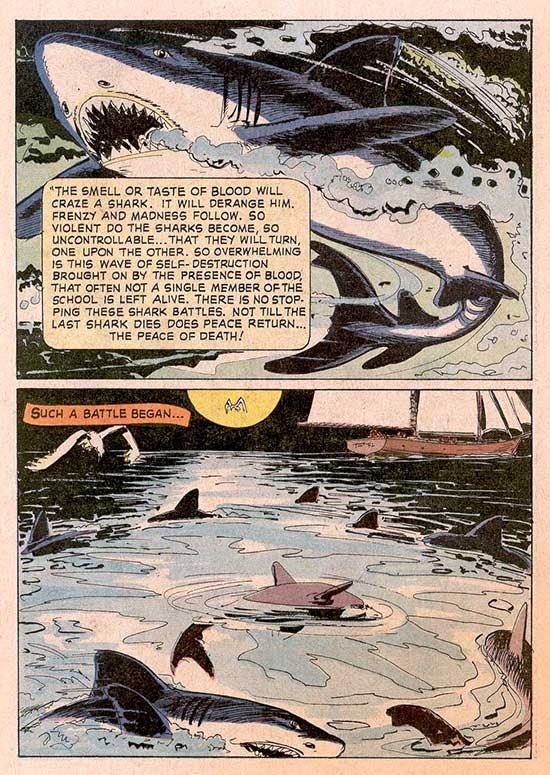 We felt the surreal shark-oriented story would be perfect for fans of Discovery Channel's Shark Week. 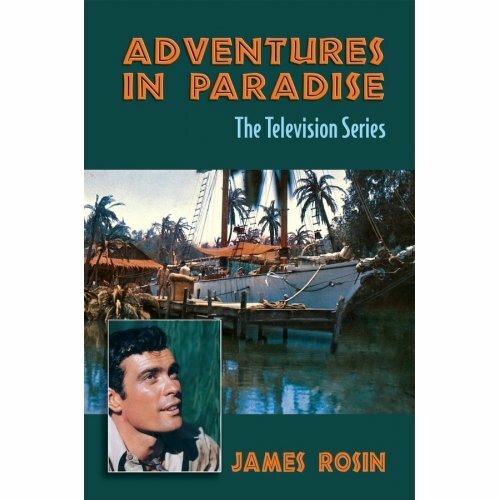 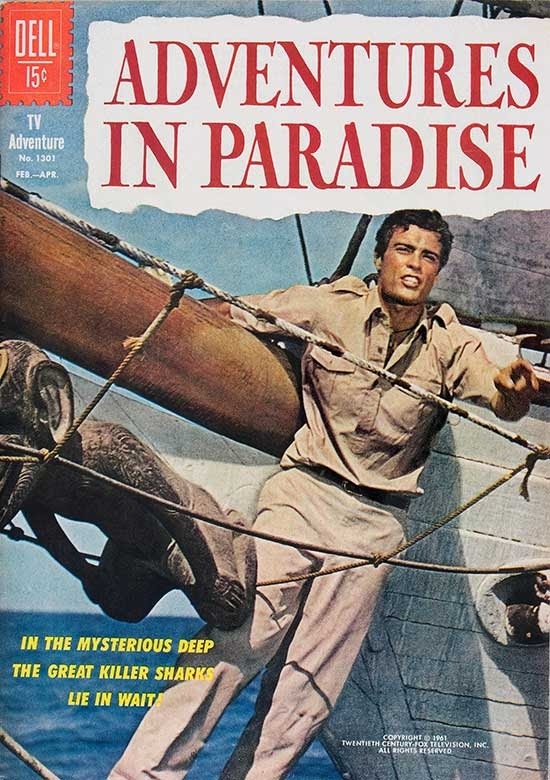 Note that Adventures in Paradise is not running on tv, nor is it currently available on VHS or DVD! 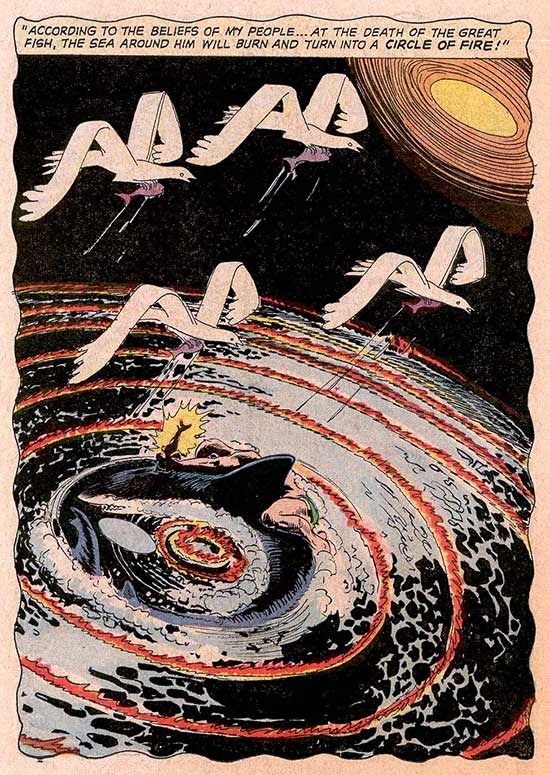 Please Support the Secret Sanctum of Captain Video! 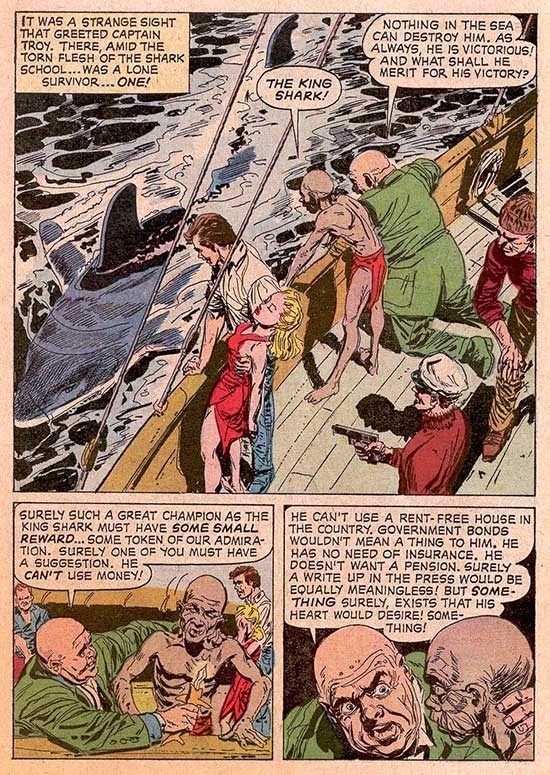 ...a scholar obsessed with South Seas legends of a "King Shark" hires Adam Troy and his schooner, Tiki to travel to the island where the legend originated. 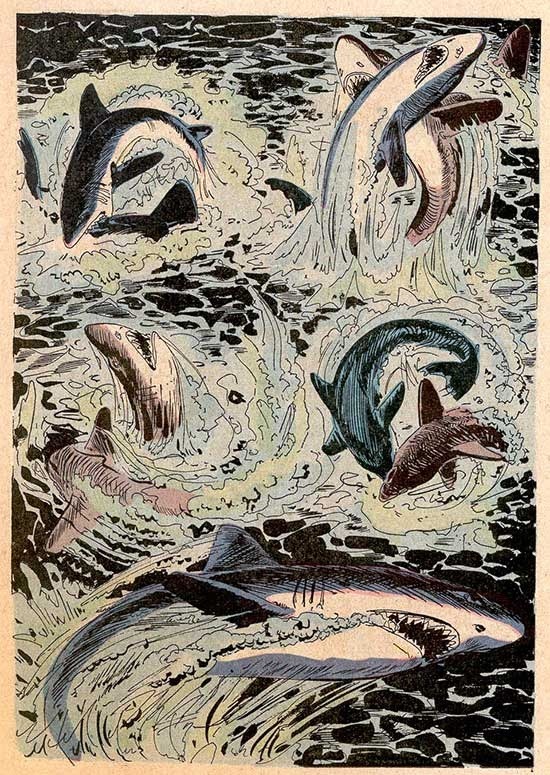 Better take a break before we're eaten! 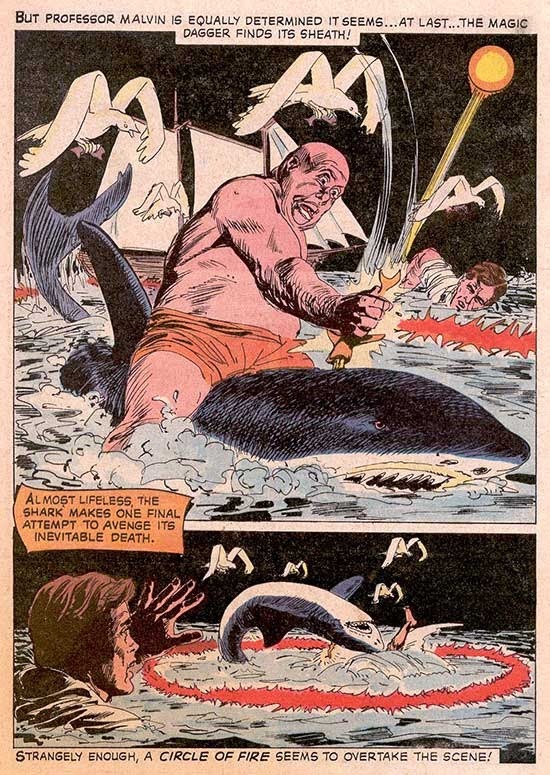 Be here TOMORROW for the even weirder conclusion! 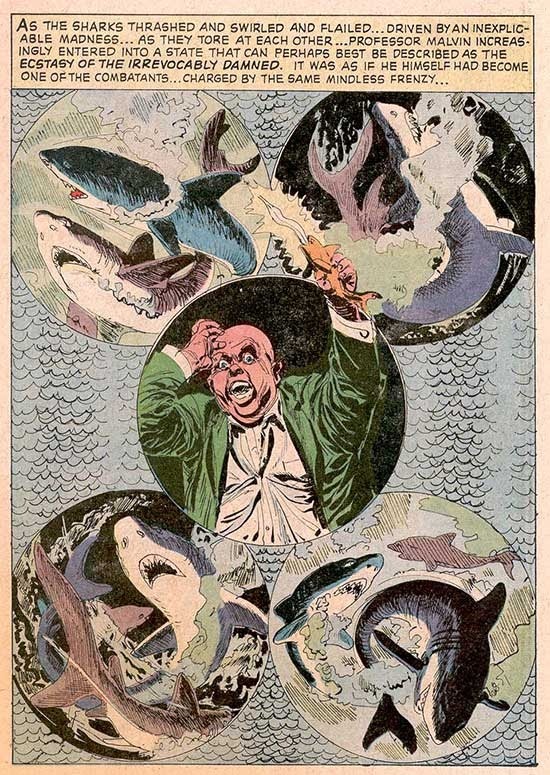 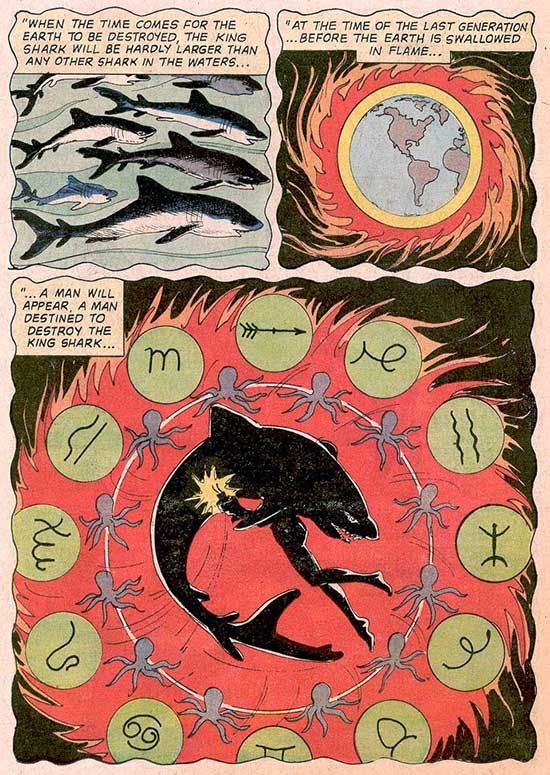 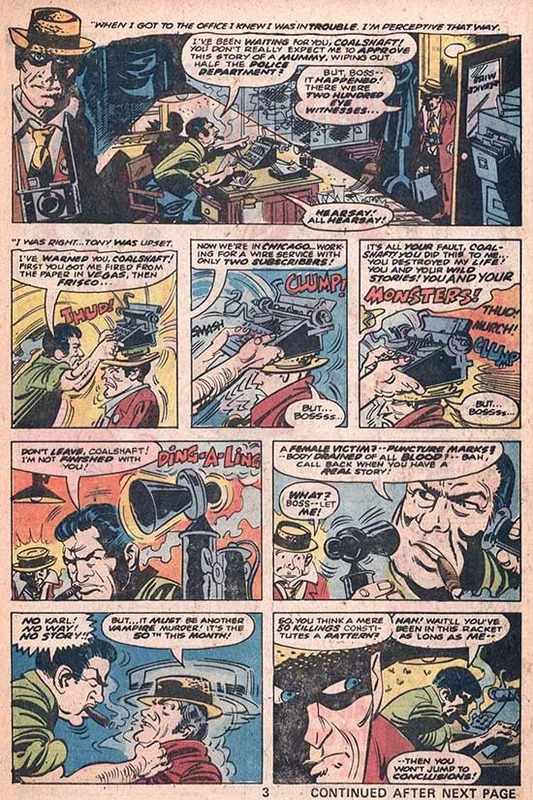 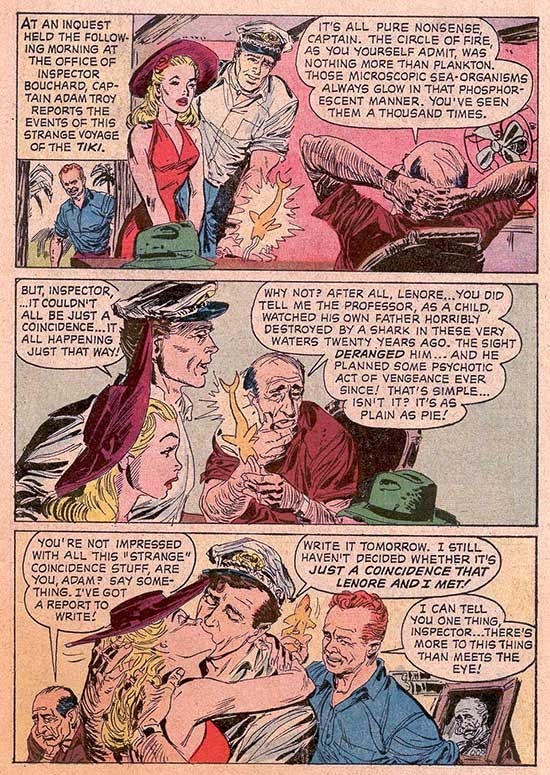 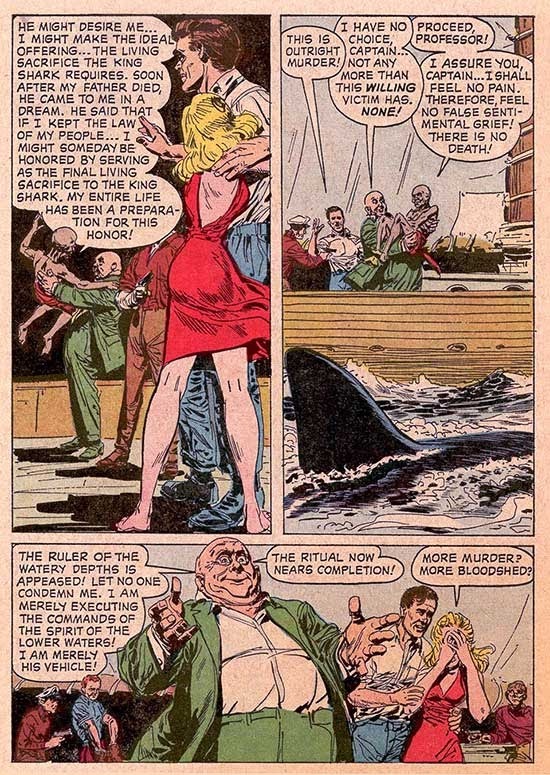 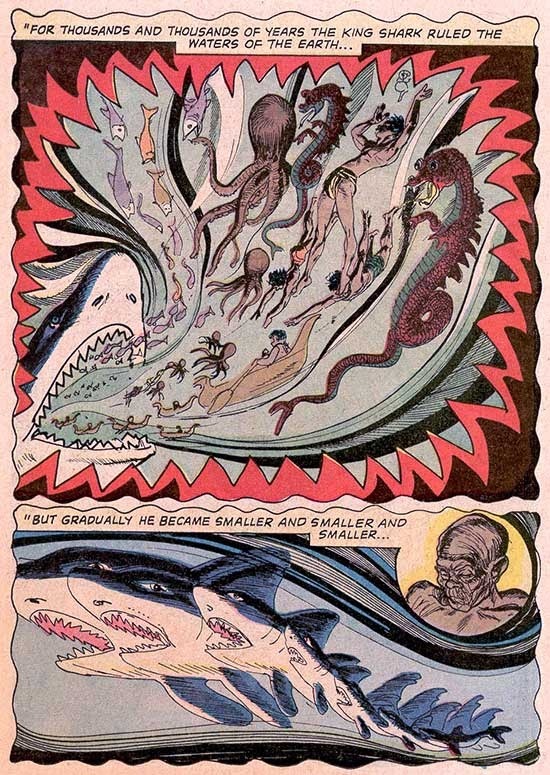 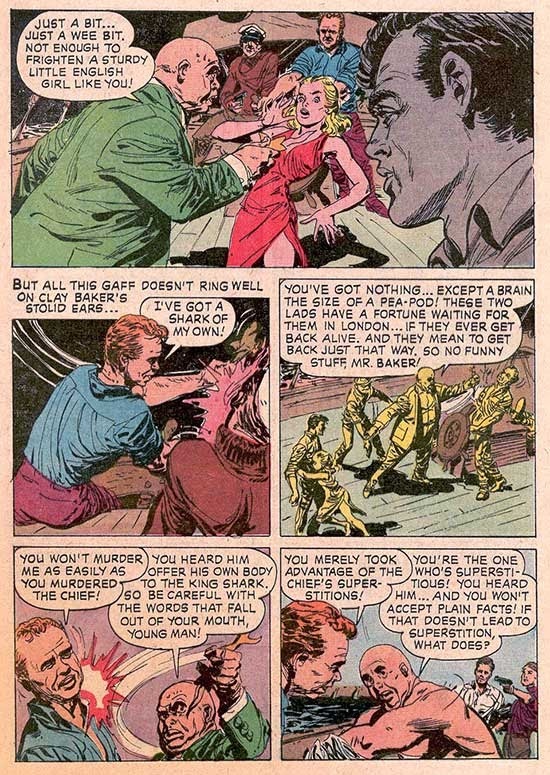 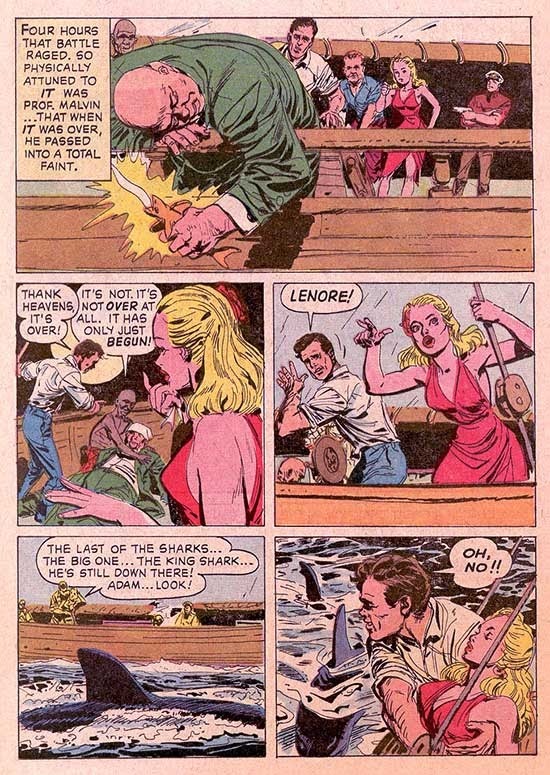 This never-reprinted tale from Dell's Four Color #1301 (1962), illustrated by Jack Sparling, was the only comic story about the series ever produced. 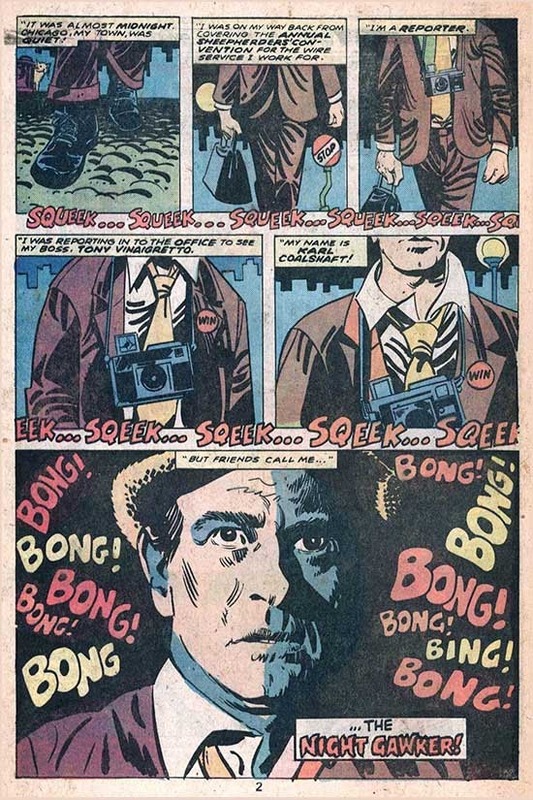 Considering the extreme verbosity of the script, I wonder if this was a script for a TV episode that was simply too expensive to produce, so the producers turned it over to the comic publishers and recommended it be adapted into graphic form. 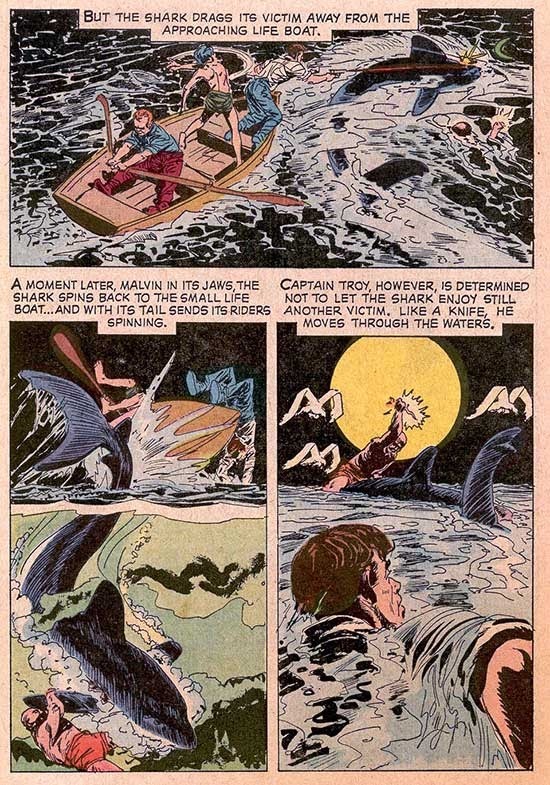 It references backstory about the ongoing characters (shark-related incidents in their pasts) that licensed material like comics and paperback novels couldn't create independently, lest they contradict possible future stories on the show itself!